The risk of an inadvertent nuclear war is rising because of the entanglement of non-nuclear weapons with nuclear weapons and their command-and-control capabilities. The entanglement of non-nuclear weapons with nuclear weapons and their enabling capabilities is exacerbating the risk of inadvertent escalation. Yet so far, the debate about the severity of this risk has been almost exclusively limited to American participants. So Carnegie teams from Russia and China set out to examine the issue and answer two questions: How serious are the escalation risks arising from entanglement? And, how do the authors’ views compare to those of their countries’ strategic communities? 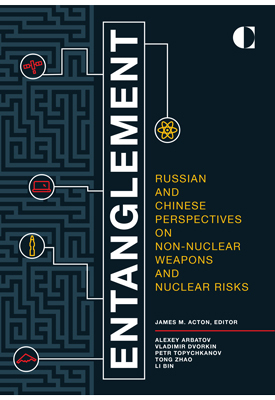 Entanglement has various dimensions: dual-use delivery systems that can be armed with nuclear and non-nuclear warheads; the commingling of nuclear and non-nuclear forces and their support structures; and non-nuclear threats to nuclear weapons and their associated command, control, communication, and information (C3I) systems. Technological developments are currently increasing the entanglement of non-nuclear weapons with nuclear weapons and their enabling capabilities. Entanglement, driven by technological and doctrinal developments in both Russia and the United States, is giving rise to the risk that a non-nuclear conflict—even a local one—might escalate rapidly and unintentionally into a global nuclear war. This danger is underestimated by politicians and military experts—including in Russia—because of a deeply rooted belief that escalation would be deliberate and not inadvertent. The concept of an “air-space war,” which is at the center of contemporary Russian strategic thought, is ill-defined. Russian strategists appear to imagine a relatively prolonged conflict in which the North Atlantic Treaty Organization (NATO) launches non-nuclear air and missile strikes against Russia. Because of the inevitable limitations in Russia’s ability to defend against these attacks, it might have to resort to the limited use of nuclear weapons in order to compel the United States and its allies into backing down. Such a conflict, involving nuclear and non-nuclear operations, defensive and offensive capabilities, and ballistic and aerodynamic weapons, would create a breeding ground for entanglement. An enduring concern among Russia’s leadership is the threat of a massive disarming strike using non-nuclear high-precision weapons. In a non-nuclear conflict, U.S. strikes might inadvertently spark concern that such a counterforce attack was under way. For example, because strategic submarines and bombers are kept at the same bases as general-purpose naval vessels and aircraft, strikes designed to target the latter might unintentionally destroy the former. That said, the effectiveness of an attempted disarming strike by the United States using conventional cruise missiles—and, in the future, hypersonic boost-glide weapons—backed up by missile defenses would be highly questionable. Indeed, Russia is already investing in the capabilities needed to ensure the survivability of its nuclear forces. While this reality may cast doubt on the validity of the concerns held by Russia’s leadership, these concerns may actually be motivated by doubts about whether it is possible to deter a conventional first strike by the threat of a massive nuclear response. In practice, however, Moscow might retaliate early with a limited strategic nuclear strike. Alternatively, it might even preempt the United States with selective strategic nuclear strikes to thwart U.S. naval and air forces that were perceived to be deploying for the purpose of initiating, or actually initiating a massive air-space attack. The co-location of nuclear and general-purpose forces in the Soviet Union and now in Russia was and is prompted by economic and administrative considerations, not by the strategic goal of trying to deter U.S. non-nuclear strikes against Russian general-purpose forces through the threat of nuclear escalation. At the moment, Russia’s capability to launch non-nuclear strikes against U.S. strategic sites is very limited, though could be enhanced by the acquisition of hypersonic weapons. However, selective strikes against, for example, radars in Britain, Greenland, and Alaska, which provide both warning of a missile attack and support for ballistic missile defense operations, would be feasible but potentially escalatory. Both the United States and Russia appear to have significant non-dedicated and potential anti-satellite capabilities. According to Russian thinking, the effectiveness of NATO’s superior high-precision long-range non-nuclear weapons depends on space-based enabling systems, creating a vulnerability that Russia, even in a non-nuclear war, could not fail to take advantage of. Russia is also concerned about threats to its own satellites. Entanglement arises because some of the satellites that might be attacked in a non-nuclear conflict also serve the United States’ or Russia’s strategic nuclear systems. As a result, their destruction would threaten to immediately escalate a war to the nuclear level, especially since strategic forces would probably be on top alert, even in the case of a local armed conflict. Communication satellites, some of which are important for the command and control of missile submarines at sea and bombers on patrol, would be possible targets. Attacks on early-warning satellites could be even more dangerous. While these satellites would likely remain unaffected by anti-satellite operations during the course of a non-nuclear war, it is difficult to be certain. In particular, for selective nuclear or conventional strategic strikes to be effective, they would have to penetrate the opponent’s missile defenses, which might require neutralizing early-warning satellites first. The loss of Russian early-warning satellites might be considered as a precursor to a counterforce strike and provoke Moscow to initiate the sequence to launch intercontinental ballistic missiles (ICBMs)—though, under standard procedures, the actual launch would probably await attack confirmation by land-based early-warning radars or the destruction of those radars. The risks of inadvertent escalation resulting from entanglement are real and growing. Because of Chinese policy choices, however, they are also somewhat less serious than many foreign experts believe. Inadvertent escalation has not been a traditional element of Chinese strategic thinking. Moreover, China has had little direct experience with nuclear crises, which taught the Soviet Union and the United States about this danger. In recent years, China has been paying more attention to inadvertent escalation—although this process has been hindered by the high degree of compartmentalization within the Chinese system. Most (if not all) Chinese experts have complete faith in China’s no-first-use commitment and believe it greatly contributes to avoiding escalation. Many experts share the belief that military technologies, in and of themselves, do not necessarily make escalation more or less likely. Instead these experts emphasize the importance of specific deployment and employment strategies. There is also suspicion among Chinese experts that the U.S. stress on escalation risks is intended to undermine China’s legitimate military modernization efforts. The multifunctionality of certain weapons and of certain military assets that could be targeted in a conflict could lead to inadvertent escalation. For example, some Chinese experts have argued that, in a conventional war, China should consider destroying American early-warning satellites to ensure the efficacy of Chinese conventional missile strikes against regional targets. The United States might, however, interpret such strikes as a very provocative attempt to deliberately undermine the U.S. capability to intercept Chinese ICBMs launched against the U.S. homeland. Misinterpretation could also be caused by the deployment or employment of offensive weapons capable of threatening both nuclear and conventional targets. Some underwater unmanned vehicle operations, for example, can simultaneously threaten an enemy’s nuclear ballistic missile submarines and its attack submarines. Even if the United States wanted to threaten only China’s attack submarines and not its ballistic missile submarines, there would be a real risk that China would nonetheless suspect that its sea-based nuclear deterrent capabilities were in danger. China did not entangle its nuclear and non-nuclear forces for the purpose of protecting the latter. It is now discovering, however, that such entanglement is potentially useful from this perspective and is correspondingly reluctant to increase its vulnerability by embarking on a process of separation. Misunderstanding can result from divergent views about the purpose and implications of deploying particular weapons or the circumstances in which those weapons might be used. The United States, for example, probably overestimates the likelihood of China’s using anti-satellite weapons in a conflict, potentially making it prone to overreact to ambiguous indicators that Beijing is considering such use by, for example, launching a preemptive strike against perceived Chinese anti-satellite assets and facilities. Meanwhile, the United States argues the Terminal High Altitude Area Defense (THAAD) system, which has been deployed to South Korea, is exclusively focused on defending against North Korean missiles. Chinese experts have, however, concluded that it is really directed at China, and have argued that China should be prepared to attack the THAAD system in the event of a U.S.-China military conflict. If Beijing were to launch such a strike, the United States and China would have very different understandings about Chinese intentions. China would believe that the strike was quite understandable and justifiable, and that it should not precipitate a U.S. overreaction. American decisionmakers, by contrast, would likely see the strike as extremely provocative. The development and deployment of certain non-nuclear technologies could influence a country’s attitude toward risk-taking during a crisis and make it more or less likely to escalate. For example, Chinese experts believe—based on the statements of U.S. officials and media reporting—that the U.S. government is exploring the option of using cyber weapons to undermine potential enemies’ strategic missiles and nuclear C3I systems during a crisis. For the United States to develop effective cyber capabilities, it needs to conduct constant probing during peacetime to map its enemy’s network infrastructure and identify potential vulnerabilities. Such cyber reconnaissance may be occasionally detected and could therefore alert the enemy to the potential threat of cyber attacks against its nuclear deterrent. This heightened awareness of vulnerability could make a state more risk-averse—and prone to escalate—in a crisis. The introduction of certain non-nuclear technologies could mitigate or exacerbate the fog of war, thus affecting the risks of inadvertent nuclear escalation. Some Chinese analysts, especially those arguing for the use of anti-satellite weapons in a limited regional war against the United States, tend to view the thickened fog of war that would result from such strikes as a tactical military advantage for China. Another consequence, however, is that the United States might misinterpret Chinese military moves—such as exercises or the mobilization of missile forces—as preparations for actually using nuclear weapons and, as a result, might initiate preemptive strikes against Chinese nuclear forces or facilities. The fog of war can also create problems for the effective flow of information between oneself and the enemy. The increasing use by the United States of unmanned military systems, such as unmanned underwater vehicles, that can potentially undermine China’s nuclear capabilities exemplifies this problem. Ironically, the belief that inadvertent escalation is improbable actually makes it more likely because political and military leaders are left less inclined, in peacetime, to take steps that could mitigate the risks, and more inclined, in wartime, to interpret ambiguous events in the worst possible light. Risk mitigation should be a priority for the U.S. government, though there is little evidence to suggest it is. Because of poor U.S.-Chinese and U.S.-Russian political relations, and because of disagreements about which state is to blame for causing escalation risks, unilateral actions are currently the most realistic approach to risk-mitigation. Raising awareness of inadvertent escalation risks among the individuals responsible for strategic-level decisionmaking in a crisis and factoring these risks into acquisition policy and war planning could be a powerful approach. Ideally, China, Russia, and the United States would all embark on this process, and each should do so irrespective of whether the others do. U.S.-China and U.S.-Russia intergovernmental discussions would be more challenging. Initially, the main purpose of these dialogues might simply be to assess escalation risks more accurately by better understanding a potential adversary’s perspective. Advanced conventional weapons, the survivability of space-based nuclear C3I assets, and the interactions between cyber weapons and nuclear C3I systems could be initial foci for discussions. Over the long term, cooperative confidence building and even formal arms control could play an important role in risk mitigation—though their prospects are currently bleak. Nonetheless, governments can and should start their homework to develop and assess proposals. The United States and Russia should assess transparency agreements that would preclude the “tacit massing” of platforms for delivering air- and sea-launched cruise missiles within range of the other’s “strategic targets”; an agreement to prohibit the testing and deployment of dedicated anti-satellite weapons; and the inclusion of intercontinental boost-glide systems under the central limits of a successor to the New Strategic Arms Reduction Treaty. There are many challenges to cooperative approaches. However, whatever real and serious U.S.-Russian and U.S.-Chinese disagreements exist, none of these states should want to reach the brink of a nuclear war—or go beyond it—before seeing the value of efforts to mitigate the risks of inadvertent escalation. ENTANGLEMENT SHOULD BE RESPONDED ACCURATELY, EQUALLY, AND PROMPTLY.